The Slocan Valley Youth Centre is focused on providing local members of the youth with a fun, safe, and inclusive environment. Open Friday and Saturday evenings from 7 pm – 11 pm for ages 12-18 only. Please note that this age change took place Jan 1 2019. The Youth Centre staff are always looking for new and exciting ways to keep youth engaged. Drop in this weekend to see what is new! Like and follow our FaceBook and Instagram pages to stay in touch and see what is happening for youth in your community. Have you heard about our Slocan Valley Youth Centre Van? 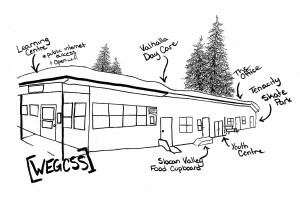 In 2014 the Slocan Valley Youth Network asked youth ages 12-19 yrs how they would spend a grant to enhance their experience growing up in the Slocan Valley. They wanted to improve access to transportation and they wanted to buy a bus. 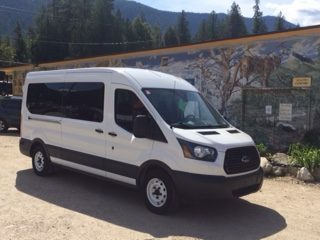 A 15 passenger van was purchased providing Slocan Valley Youth with free, reliable, and safe transportation up and down the Slocan Valley. The van runs Fridays and Saturdays from 5:00 pm- 1:00 am. See our schedule for times. ** This is free transportation for Slocan Valley Youth, however, all youth MUST sign the user agreement(can be picked up on first ride). Volunteer in-kind hours to drive a bus? Read more about our 15-seater bus from Community Directed Youth Funds. If you have a Class 4 drivers licence, please contact us. To provide a safe and welcoming environment for youth. To provide mentorship and a receptive ear to the problems and concerns of the young people we serve and to refer serious concerns to the administrators. To alleviate the isolation felt by many rural at risk youth. To be role models for youth in our communities. To provide qualified on site First Aid.